Some royal wedding tiaras are grand; some are a bit more subdued. Today's tiara, the Lannoy Tiara, falls into the latter category. 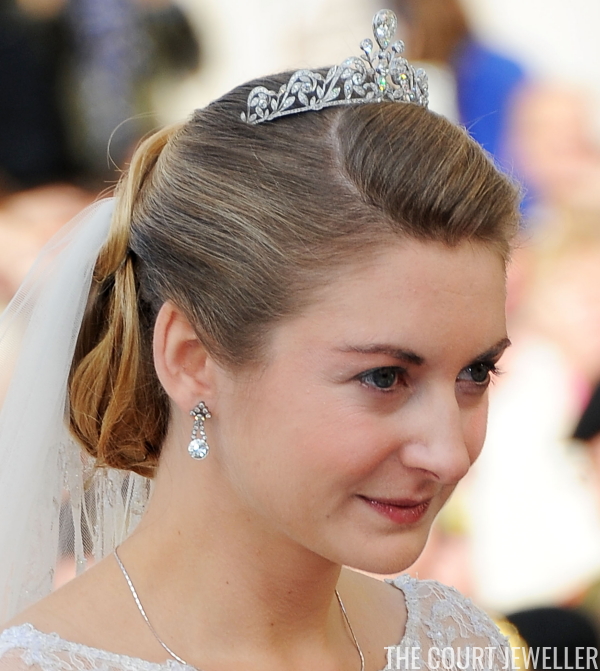 One of the world’s newest royals wore this petite diamond tiara at her 2012 wedding. 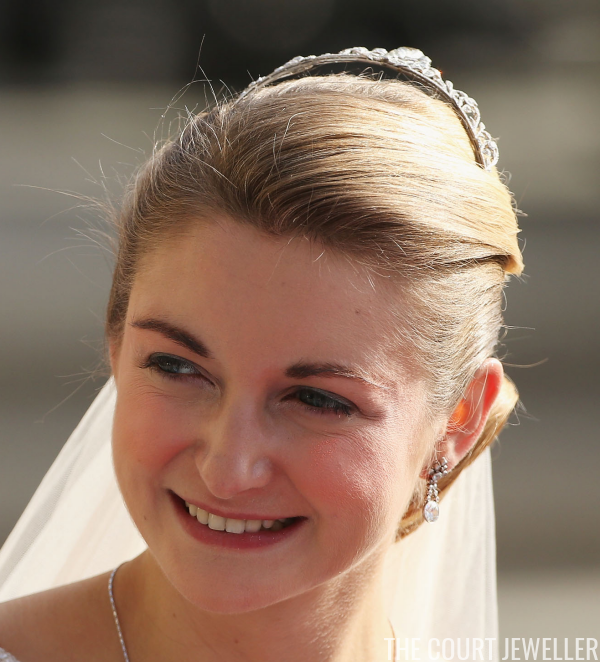 Countess Stéphanie of Lannoy chose to wear her family’s tiara on the day she married Hereditary Grand Duke Guillaume of Luxembourg, rather than one of the showstopping diamond tiaras from her new royal family’s extensive collection. 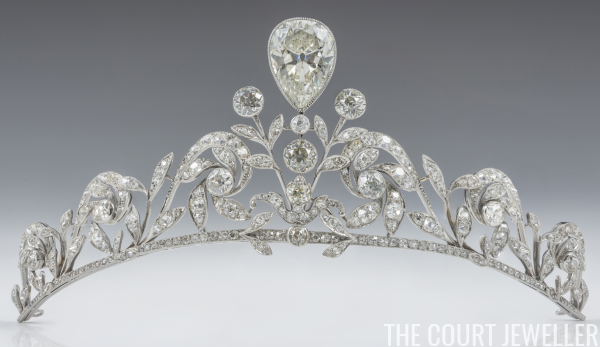 The Lannoy tiara may be smaller than some, but it is absolutely jam-packed with diamonds — almost 300 of them! — including the large pear-shaped diamond that sits atop the sparkler. The piece features delicate floral designs supporting that large, eye-catching diamond. The tiara is constructed using a millegrain technique. The tiara was made in 1878 by Altenloh, a Belgian jewelry firm that also supplied pieces to other Belgian royals and aristocrats. 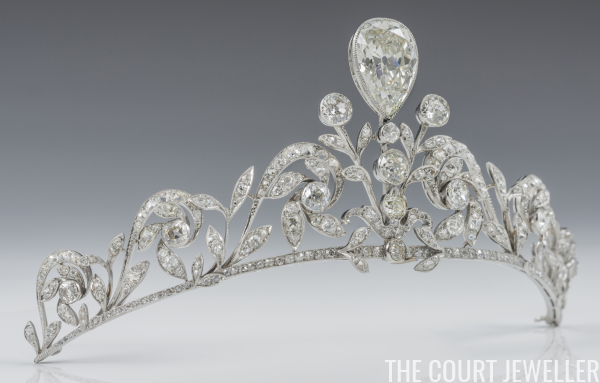 The small sparkler was also worn by Stéphanie’s sisters and sisters-in-law at their weddings, so by choosing the tiara, she was continuing the Lannoy family tradition. The size and design of the tiara apparently makes it difficult to properly anchor, however. 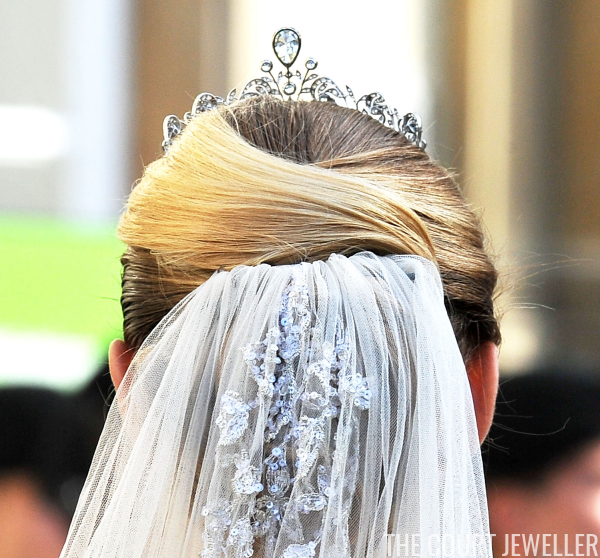 On Stéphanie's wedding day, the tiara flipped backward, as it was only fastened to her hairdo at either end. Because the piece lacks the velvet-lined base that many royal tiaras have, there appears to be no reliable way to adequately secure the center of the piece to the wearer's hair. Beyond tradition, the wearing of her family’s tiara was yet another way for Stéphanie to remember her mother, who died shortly before the wedding. And now that she’s the wife of the heir, she’ll have plenty of time to pilfer through her new family’s tiara stash. Indeed, she's worn several of the family's sparklers since her wedding day, plus a new diamond tiara of her own.